Technological advancement has played a huge role in helping businesses increase productivity and save money. 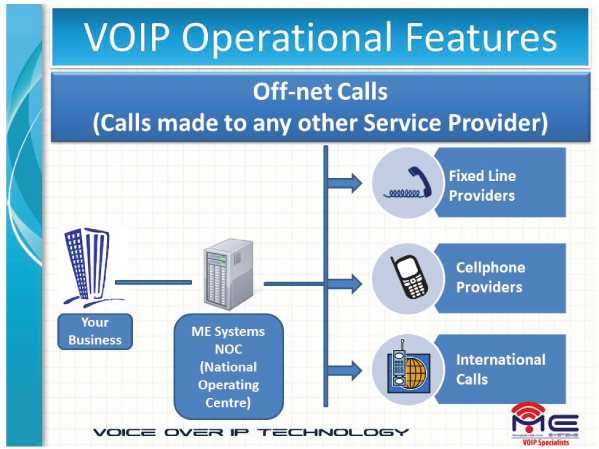 One such tool is Voice-over-Internet Protocol (VoIP), which moves phone communications to a network connection, allowing you to access communication services from anywhere. VOIP (Voice over Internet Protocol) is the technology that allows telephone calls to be made over any data link like ADSL, Optic Fibre or LTE. Though VoIP it is quickly gaining popularity, many businesses are still on the sidelines, doubtful whether VoIP is right for them. VOIP is the voice technology for the future, improving your line quality, reduce telecommunication cost, easy to install, more than just a voice call and flexible. Technological advancement has played a huge role in helping businesses increase productivity and save money. 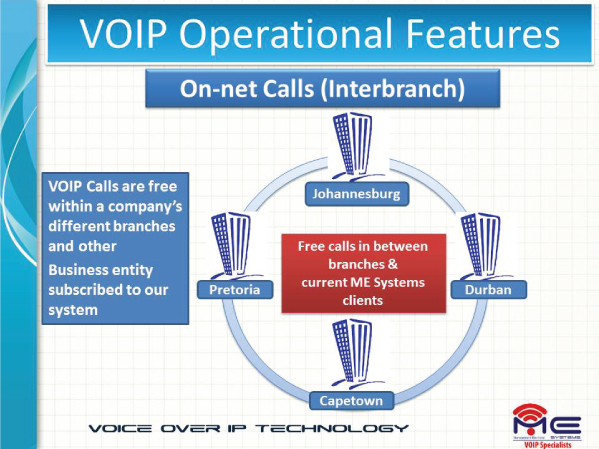 One such tool is Voice-over-Internet Protocol (VoIP), which moves phone communications to a network connection, allowing you to access communication services from anywhere. Though VoIP is quickly gaining popularity, many businesses are still on the sidelines, doubtful whether VoIP is right for them. 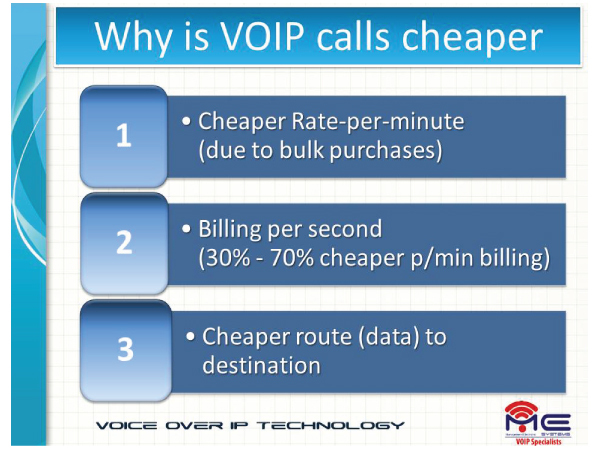 With that in mind, here’s what you need to know about VoIP to help decide if it’s the right system for your business. 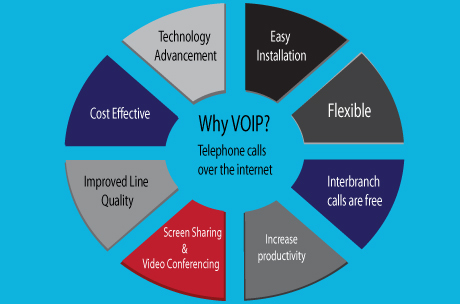 Since its inception, the quality of VoIP service has come a long way. Today’s VoIP services allow you to make and receive calls using standard phones. Sound quality has improved tremendously, to the point where many businesses have abandoned traditional phone systems in favor of VoIP. 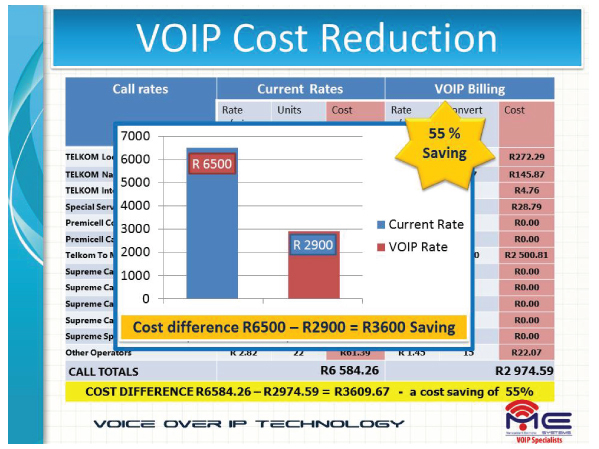 Operating costs for the majority of VoIP service providers are significantly lower than traditional phone companies. This allows VoIP providers to charge customers ,you,much less than their competitors, both in calling rates and monthly fees. With VoIP, businesses no longer have to maintain separate networks for phones and data which also helps save money. And while some businesses do pay their current phone company extra for features like call holding, call display, and call forwarding, most VoIP providers include these features in their product, meaning you don’t have to pay extra for the features you need. With most VoIP connections, there’s no need to install switching boards or phone connections. Some systems can be installed easily by downloading an app to your computer, while others might require that you install an adapter that converts voice signals into digital signals using your existing phones. These adapters are medium and in most cases all you have to do is plug the phone’s cable in before plugging the adapter into an Internet connection socket. Many VoIP programs also allow for chat capabilities, video calls, video conferencing, and even screen sharing. Not only that, but you’ll be able to see if your employees are available through presence technology, as well as giving them more ways to stay connected. VoIP systems allow you to do far more than is possible with traditional phone technology. Take your phone system with you: As long as you have access to a broadband connection you can use your VoIP system anywhere. Talk on your laptop: Many VoIP systems include telephone software that enables you to send and receive calls using a headphone unit connected to your computer. This helps eliminate the risk of you missing an urgent call when you’re on your laptop. Receive voice mail and faxes via email: Many VoIP services allow you to have voice mail and faxes forwarded to your email inbox. You then receive all your messages in one place, and your voice mail and faxes can be easily archived or forwarded. Have virtual phone numbers: Your phone number can have any available area code, meaning you can have a business based in one place but can have a phone number with a different area code; advantageous if your business has, or wants, customers in specific areas. Increase productivity: Many VoIP phone numbers can be configured to simultaneously ring on multiple devices, such as your cell and land line phones. This eliminates time-consuming phone tag. According to a recent survey conducted by Sage Research, the increased productivity enabled by Internet telephony added up to 3.9 hours per week, per employee. No matter what industry you operate in, VoIP is a surprisingly flexible, affordable, and continuously evolving technology. 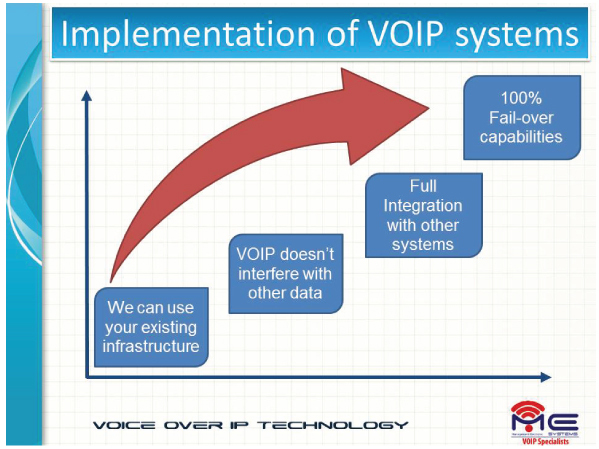 Interested in implementing a VoIP system into your company? We support both ADSL Capped and ADSL Uncapped Services from 1MB up to 4 MB Connections. The new wireless community uses the same method of transmission than digital subscribers (ADSL), but wireless. We are a WISP (Wireless Internet Service Provider), providing clients VOIP connection through this connection for more reliable voice connections at a competitive price. Fibre Broadband is the future generation for high speed Internet transfer and theoretical offers broadband speed of 24Mb. LTE is a 4G wireless communications standard developed by the 3rd Generation Partnership Project (3GPP) that’s designed to provide up to 10x the speeds of 3G networks for mobile devices such as smartphones, tablets, notebooks and wireles hotspots. Reliable Communication is a constant challenge for distant Remote Sites. 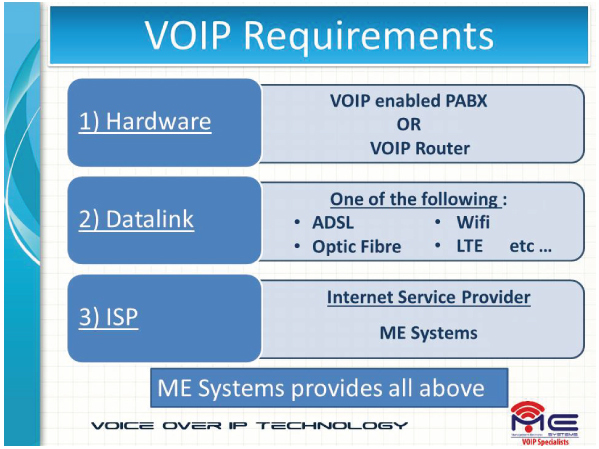 ME Systems offers reliable VOIP communication and Internet Access whereever you are situated. We offer 3G networks, for your Internet and Telephone connections. Our high-performance 3G WiFi Router with Voice transmits a high-speed WiFi connection. A VOIP converged system is a traditional PBX which can use VOIP technology, attaining all its benefits. 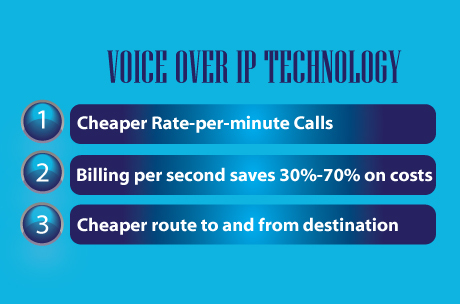 VOIP not only allows you to make cheaper calls but also opens up new features and functionality on your system. 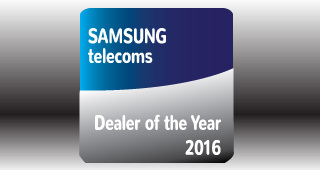 Enterprises with multiple branches – Connect to head office Samsung PABX via an integrated hosted solution. We provide all these latest new technologies!